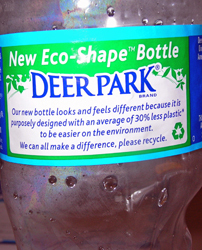 No kudos to Deer Park Bottled Spring Water for its New Eco-Shape Bottle from us. Deer Park claims that the plastic bottle has “an average of 30% less plastic to be easier on the environment.” Deer Park, I picked up your plastic bottle from the side of the road where it would eventually wash into the river which would empty into the ocean which would propel it to the Great Pacific Garbage Patch. No plastic is eco-safe. Not even recycled plastic, but at least, it’s not swimming in the Pacific Ocean. Buy a reusable water bottle. We can all make a difference. At the bus stop this morning, there were two paperback books left behind. Just as a few weeks ago, someone left two children’s books there. At least, these books found a home. Another bus rider took the High Adventure novel. 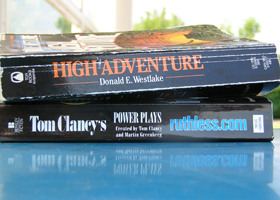 By the time I returned home, the Clancy novel was gone. Although I don’t recommend leaving stuff and hoping that someone will take it, I’m glad that someone got the books. Leaving books on top of the newspaper rack is littering. 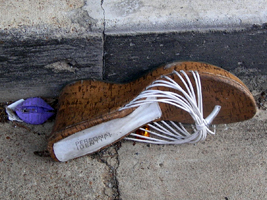 Everyone must leave something behind when he dies…. A child or a book or a painting or a house or a wall built or a pair of shoes made. Or a garden planted. Something your hand touched someway so your soul has somewhere to go when you die, and when people look at that tree or that flower you planted, you’re there. It doesn’t matter what you do, so long as you change something from the way it was before you touched it into something that’s like you after you take your hands away. 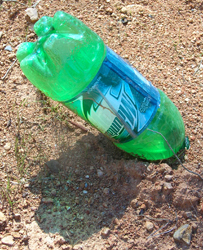 Why did I think of that statement when I saw this Mountain Dew plastic bottle “planted” in the dirt at a construction site? Is this how the next generation will remember us? The huge pile of plastic floating in the ocean? I still have flowers that return each year that my mother gave me. A few years before she died, she gave me a plant called a magic lily, or a surprise lily. The summer after she died, it bloomed for the first time. That’s where I see her soul: in flowers or when I eat a homegrown tomato. One of my New Year’s Resolutions was to get books from the public library, rather than buy them, which has been my custom for years. 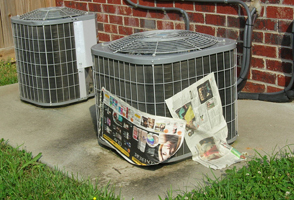 My husband and I love books, but I realize that books generate paper and waste. I’m trying to become a minimalist. I’ve been getting books from the Bellevue branch of the Metro Nashville Public Library since January. This library, which is destined to be replaced soon, is the most lifeless place I’ve ever visited. The libraries of my childhood and my college years were inviting places, where I used to linger for hours. I’m the same in book stores, where books are alive. Before it moved to the pretentious Mall at Green Hills, I could almost live at Davis Kidd bookstore. With the Bellevue branch of the Public Library, I’ve learned to reserve a book on line, go in when it’s ready and check out without attempting to speak to any one or spend time searching the stacks. None of the librarians or workers are very friendly. One insulted me when I signed up for my library card by stating, “You’re older than I am.” Usually the librarians’ noses are pointed downward and don’t acknowledge human life. Anyway, I’d never read Fahrenheit 451. I’d heard of it; didn’t realize that Bradbury wrote it; didn’t know what it was about: a society where books have been banned. It’s like having HDTVs on every wall showing reality television shows 24/7. I’m half-way through the book. I don’t know why I never read it before now, but it has become one of my most important books. It’s my worst nightmare – a society without books. I love the internet, HDTV and YouTube, but before I turn in every night, I prop my feet up on the ottoman and escape to a book. It’s alive, not like the Bellevue branch of the Public Library. The entire parking lot of the SunTrust on Charlotte Avenue was filthy. Please clean it up. Once, I didn’t have a camera to photograph my very muddy legs and feet.